Hi! I’m so glad you are here, because today I’m sharing one of my favorite easy breakfast recipes! Who here loves a “grab ‘n go breakfast?” Who here loves an Egg McMuffin?? 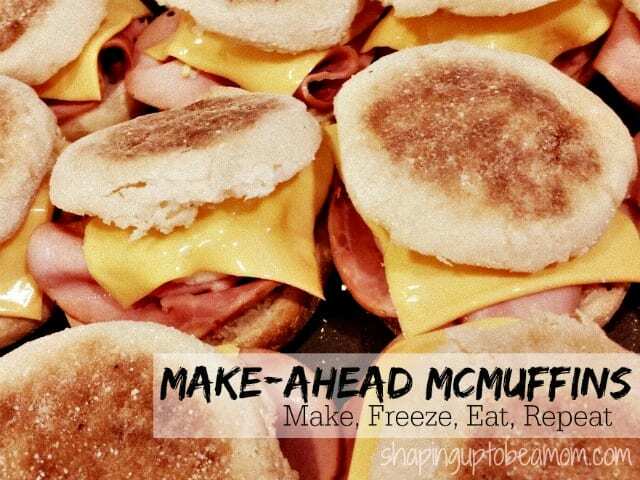 Well good, cause today we are making Freezer Egg McMuffin Sandwiches! I’m going to share with you exactly how to make a ton of these yummy guys all at once, how to store them, and I’ll show you how ridiculously easy it is to reheat them when it’s time to eat! Look, I’m a busy mom, just as I bet you are. And who has time to dedicate to breakfast on those crazy, gotta-get-out-the-door mornings?! Not me. These sandwiches are perfect for the husband on the go grabbing a quick bite on his way to work, or those kiddos rushing out the door on their way to school. Imagine how good you’ll feel when you know you can have a delicious, nutritious breakfast ready for everyone in your family, in just about a minute per person! Ahhh, that alone would make me jump out of bed in the morning! No. More. Hectic. Mornings! Speaking of which, now is a great time to grab free printable recipe cards of my favorite freezer breakfast recipes! So throw on an apron after you hit the grocery store and get ready to prep 30 amazing Egg McMuffin breakfast sandwiches. That’s what’s for breakfast! Mmm, I’m so hungry! Click the next button for the ingredients you’ll need! I know, right?! Definitely going to be making (and eating) these ASAP! These look delicious. Breakfast at my house is usually a grab-n-go event so these will work perfectly! These looks delicious! I bet my kids would love these for breakfast on our really busy school mornings. This is a great idea for grab n go breakfast! That’s such a great idea! Thanks for linking up to Sweet and Savoury Sunday, stop by and link up again. Have a great day!! Your round-up looks great! The only suggestion I have is to have the big photo link to my post, since people often click on delicious-looking photos to get to the recipe. Thanks for including me and linking back! Hi! Do you lightly toast and/or butter the muffins prior to assembling them? Hi! It’s Layla here! Great question! Although I didn’t do either for mine in the post, I have buttered them in the past because when you microwave them it melts to an oh-so-delicious buttery goodness! I don’t see a need to lightly toast them in the beginning, however, if you have extra time in the grab-n-go process, one method I would suggest would be to microwave them first and then either toast them in a toaster oven or even put them in a fryer pan just to get the muffins a bit more crunchy. The microwave is the re-heater process, but the fry pan definitely brings back the perfect firmness to the bread. (PS… this is the process I use to reheat leftover pizza… delish!) Thanks for your question and interest! Enjoy!